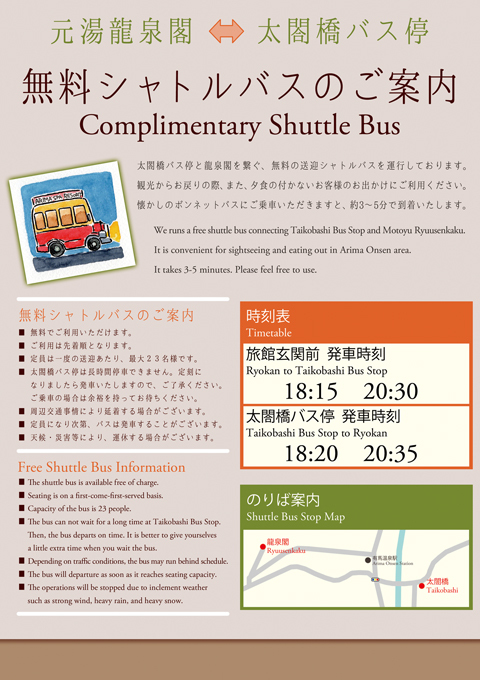 We runs a free shuttle bus connecting Taikobashi Bus Stop and Motoyu Ryuusenkaku. It is convenient for sightseeing and eating out in Arima Onsen area. It takes 3-5 minutes. Please feel free to use. ■ The bus can not wait for a long time at Taikobashi Bus Stop. Then, the bus departs on time. It is better to give yourselves a little extra time when you wait the bus. ■ The bus will departure as soon as it reaches seating capacity. ■ The operations will be stopped due to inclement weather such as strong wind, heavy rain, and heavy snow.